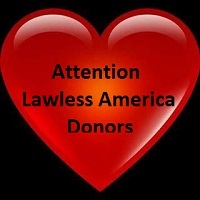 Lawless America Donors - Please contact Bill Windsor if you do not have a receipt. ...please email me. I never told anyone that their donation would be tax-deductible, so I want to be sure that no one has attempted to obtain a tax deduction for their donation. This is very important to me since I have people who have falsely and maliciously reported me to the police, FBI, and IRS for luring people to make donations under the pretense that the donations were tax-deductible. I did not do that. But if you thought it was tax-deductible, please let me know so we can clear it up. I certainly appreciate the donations, but I have not accepted any donations in over a year, and I will not accept any more. I received approximately $27,000 in donations, and the production costs for the film thus far are well in excess of $150,000. I financed the remainder personally. As promised, each donor will be listed in the movie credits as a "financier." If you haven't been keeping up with Lawless America and me on Facebook at www.facebook.com/billwindsor1 or www.LawlessAmerica.org, you may be surprised to learn that a gang of cyberstalkers has viciously defamed William M. Windsor with thousands of false and defamtory statements online. At last count, there are over 320 articles filling over 7,000 pages, written by about 700 screen names, 95% of which are aliases or anonymous. There are hundreds of screen names who have published false and/or defamatory information on joeyisalittlekid.blogspot.com. I ask whoever is the owner/operator of that site to publish this article on that site so all of the people who frequent that site know the truth and know of this demand for correction and retraction. It is impossible for me to list each specific false and/or defamatory statement as yet because there are approximately 40,000 published statements, and there are thousands, if not tens of thousands, of false and/or defamatory statements or support for such statements, and I have not yet been able to read everything. I plan to produce two expose documentary films about cyberstalking -- Slanderella and Slanderfella.